The Samantha is a soft and feminine wreath that inspires grace and humility. This arrangement features an exquisite combination of rich pink Asiatic lilies, soft white chrysanthemums and blush alstromeria, gently entwined into a wreath. 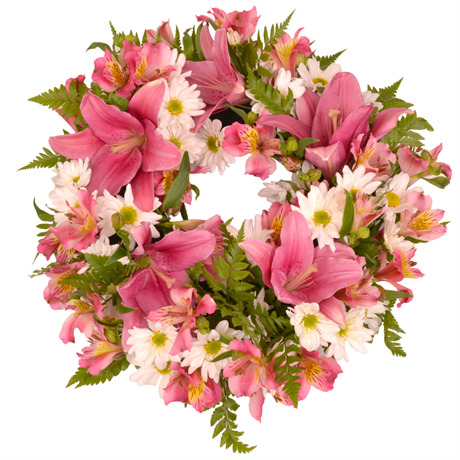 This floral gift is ideal for commemorating the life of a loved one, or as a decorative door hanging. The tender pastel pink and white tones blend together to create a regal, classic wreath. For those sending this wreath to a funeral home, we offer a timed delivery service at no extra cost, ensuring your wreath arrives before the start of the service.